"Welcome to a journey into the future..."
Let your imagination take you to a world that was supposed to be here by now! 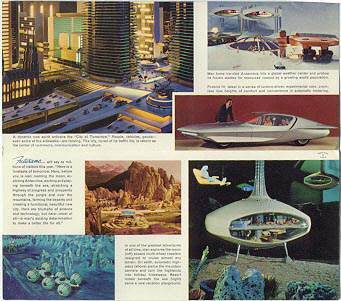 Take a vicarious trip through the General Motors 1964 Futurama exhibit! Below is a transcript of the audio narration accompanying the ride. Listen to an actual audio recording of the entire 15-minute ride provided by Ray Dashner as he rode through the pavilion on July 4, 1965! Welcome to a journey into the future — a journey for everyone today, into the everywhere of tomorrow. Never has the world held a brighter promise of things to come, or a greater need for new resources for the tools and machinery of power and mobility, for the building together of a road to a new life of abundance and a greater dignity for us all. Technology can point the way to a future of limitless promise. in the deepest of the ocean's depths; in tropic forests; in desert sands; and in the bright new cities of tomorrow's world. Let us go to these places. Let us explore together the future — a future not of dreams, but of reality. For much of what we are about to see, is even now beyond the promise, and well on its way to tomorrow's world. It is now Tomorrow. Now we can find our way along the dark, star-studded corridors of space, and make that long-dreamed voyage to our nearest neighbor in the great unknown. That silent satellite of Earth, we call the moon. On the moon — there is no air to breathe; no rain to fall; no sound that can be heard. Nothing can grow or can decay in the vacuum of this time-stilled world. Yet here is man — exploring; building his first bridgehead in his span of space. Lunar rovers float magically over powdered plains; range the crater's edge, their elastic train-like bodies conforming to every surface character of the moon. Here are bases of communication and supply — islands of existence built to withstand the melting heat of the lunar day, the shattering cold of the lunar night. Men in space now monitor the Earth, while men on Earth are finding a whole new world of answers to the worldwide needs of Man. The Earth shines more than five times brighter than its moon, and brighter still its oceans and its seas. A diamond brilliance draws us to a frozen shore. The dancing lights of an aurora, welcome us to a land of ice nearly twice the size of the United States — to Antarctica, the southern polar cap of the world. Once as remote as the far side of the moon, Antarctica is now a land of growing communities, dedicated to scientific observation and research. Here nations of the world, speaking the common language of science, work together to serve the peoples of the globe. Probes for the Earth's secrets through countless centuries of ice, in mobile laboratories, form expeditions into the vast white wastelands of the still unknown. And here is Weather Central — forecasting to the world the great climatic changes borne in the Antarctic's never-ending winds. Technicians kept warm within their walls of ice, gather data from the depths of space; from polar winds, surrounding seas. In microseconds, relaying information wherever needed, anywhere on Earth. trains of submarines transport materials and goods along the waterways of the undersea. And in warmer seas are new realms of pleasure, a weekend if you wish at Hotel Atlantis, in the Kingdom of the Sea. A holiday of thrills and of adventure; of beauty and enchantment; of radiant wonders; in the sun-bright gardens of the sea. Our new knowledge and skills — new power and mobility — have given us a new and wondrous underwater world. A miracle of gifts from the limitless treasury of the sea. In tropic waters, fabulous coral reefs lead us back to the land. An equatorial land, where nature flourishes more abundantly, and in greater variety than in any other region of the world. Yet, nowhere else have Man's productive efforts been so challenged, and for so long. Now technology has found a way to penetrate and to control the wild profusion of this wonder-world. A jungle road is built in one continuous operation. First a searing ray of light, the laser beam, cuts through the trees. Then a giant machine — a factory on wheels — grinds up the stumps and jungle growth; sets the firm foundation; forms the surface slabs; sets them in place — and the roadway bed is paved. These forest highways now are bringing to the innermost depths of the tropic world, the goods and materials of progress and prosperity; creating productive communities that can enter profitably the markets of the world. And offering to us all, enchanting tours through the storybook forests of tropic lands. The fertile green of the equator presses upward against the sloping Earth, until no longer fed by rain-laden winds, it dies against the rocky heights of the great mountain ranges of the world. The mountain barrier, legendary challenge of Man, now invites communal living in a world of awesome beauty. A new system of highways spans the continents, to transport men and goods swiftly and separately across the land. And for our deserts — a new technology — waters from the sea made fresh as rain to nourish crops planted in the sand. Produce from seed to shipment, programmed and processed by a new agriculture. A science of plenty for an ever-growing world. People live today where they will. Neither terrain nor distance a deterrent to where the men of the city build their homes. All roads lead, as they have for centuries, to the great centers of commerce and communication. As the continental highway now leads us to the City of Tomorrow. Here the city first receives its goods and produce from the factories and the fields of the world. Plazas of urban living rise over freeways. Vehicles electronically paced, travel routes remarkably safe, swift and efficient. Towering terminals serve sections of the city; make public transportation more convenient; provide ample space for private cars. And from a lower level, covered moving walks radiate to shopping areas that are now truly — marketplaces of the world. Its traditions and its faiths preserved — there is new beauty and new strength in the City of Tomorrow. In its commerce and its culture; its sports; its sciences; and its arts. The present is but an instant between an infinite past and a hurrying future. The strivings of Man — his ambitions, his achievements, his aspirations — all are mirrored in the face of his cities. Technology can point the way to a future of limitless promise. But Man must chart his own course into tomorrow. A course that frees the mind and the spirit as it improves the well-being of mankind. We have completed our ride into the World of Tomorrow. We are pleased to have been your host on this journey into the future. And to have shown you many of the things which are already on their way to serve the needs of the near tomorrow. Although many of you may wish to ride around again, it is not possible to do so at this time. Every seat for the next Futurama ride is taken and we must all leave our chairs as soon as we reach the unloading platform. Elsewhere in the General Motors Building, there is much more to see; much more to learn about. In the Avenue of Progress, other intriguing ideas designed for tomorrow. In the Products Plaza, new and exciting things available today. To these and other exhibits in this building, we cordially invite you all. ©General Motors Corporation. All rights reserved. OK, the ride's over. Try not to squint from the blinding glare of reality upon exiting!